With all of the tenderness of filet mignon, beef medallions make an elegant addition to your menu, whether you use them as an appetizer or part of your main dish. Making beef medallions is a clever way to use the meat found on the narrow end of a beef tenderloin. Avoid overseasoning or overcooking these beefy gems to allow the delicate flavor and tender texture to shine. Medallions are basically small round steaks. Occasionally, you may see medallions that come from other cuts, such as the strip loin. Typically, however, beef medallions come from the tenderloin, which is a cut most commonly used for filet mignon. Medallions are generally small with a diameter of 2 to 3 inches and thickness of 1 to 2 inches. Characteristics of the meat are much like those of the tenderloin, which comes from the animal's backbone area just beneath its ribs. Beef medallions are luxuriously tender, but the meat has milder flavor than other cuts of beef. You may find pre-cut medallions at your butcher or grocery store, buying the whole tenderloin and cutting it at home is generally a more cost effective approach to buying beef tenderloin. Because tenderloin is often such as pricey cut of meat, you don't want to be hacking it to bits with a dull knife; rather, you should use an extremely sharp knife and make careful cuts to preserve the quality of the meat. Grab a large, sharp boning knife and trim the tenderloin to remove the exterior fat and shiny outer membrane known as silverskin. If desired, cut the larger end into steaks, or keep a large portion of it intact to make chateaubriand. Slice the medallions from the narrower end of the tenderloin. Avoid overpowering the relatively delicate flavor of the meat by using seasonings, marinades and sauces to enhance the flavor of the medallions without obscuring it. If you want to keep it very simple, season the medallions with salt and pepper. Optionally, you can also coat the medallions with an herbal paste made from ingredients such as parsley, rosemary, brown sugar and olive oil. Coat the meat, cover it with plastic wrap and refrigerate it for approximately two hours. Although you don't need it, you can also pair cooked medallions with a sauce such as Madeira wine sauce, mushroom sauce or a sauce made by deglazing the pan with red wine and beef stock after cooking the beef medallions. Preserve the tenderness of the medallions by using a fast cooking method such as grilling or pan-searing. Start by heating oil in a large heavy-bottomed skillet set over medium-high heat. Alternatively, preheat the grill using medium-high heat. Once the oil is shimmering, or the grill is hot, add the medallions. Cook them five to eight minutes per side, until the exterior is golden. 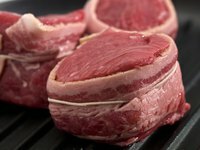 Although U.S. Department of Agriculture recommends cooking beef to a minimum internal temperature of 145 degrees Fahrenheit, many beef-lovers consider this to be too well done. For medium-rare, cook the medallions to an internal temperature of 125 F. For medium, cook it to 130 F. Remove the medallions from the pan and let them rest for three to five minutes before serving. What Is a Medallion of Chicken?